As well as loving bright nails, I’m falling for soft pastel shades. Just as mint and peach have entered my wardrobe this year, so have pastel shades featured on my fingertips. Try saying that 10 times quickly! Hello Darling’s Not Your Nanna’s Nightie collection features seven delicious shades. Nail Romance loves Mint Slice and Butter Wouldn’t Melt. Pretty Pastels from Face of Australia is a super affordable range that makes a multi coloured mani easy to do. Nail Romance loves Would you like some Orange Sherbet? and Once in a Blue Moon. L’Oreal’s Miss Candy collection features more delicious pastel shades. These polishes have a larger brush which means I can change colour in just two brushstrokes. Too easy. Nail Romance loves Monaco Roses and Riviera Lavender. 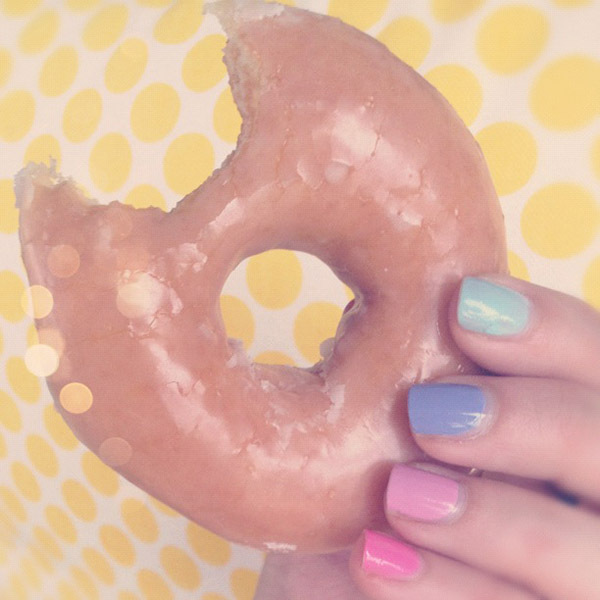 These candy coloured nails look good enough to eat! You can find more pastel nail-spiration on the Pastel Nail Romance Pinterest board. What’s your favourite pastel polish?